Michele Mehl’s idea: a 10-pound machine that can be used as an upper- or lower-body exercise bike. Skatepark struggles: Mehl was with her 9-year-old son at a skatepark in 2014 when she started passing the time by stepping up and down on a bench. Mehl had gained weight and was frustrated at missing workouts because she was always on the go. Traveling on:A longtime public-relations professional, she decided to develop a piece of lightweight equipment people could carry with them to get in a quick workout nearly anywhere. She teamed up with designer Mike Rector to create Excy — a 10-pound machine that can be used as an exercise bike for your upper or lower body. A kick start: Excy (rhymes with Etsy) started in summer of 2014, and Mehl spent the better part of a year developing the equipment. In fall 2015, she put the Excy on Kickstarter and raised nearly $23,000. She shipped the first 12 machines, gathered a lot of feedback, then made some changes and shipped the rest. 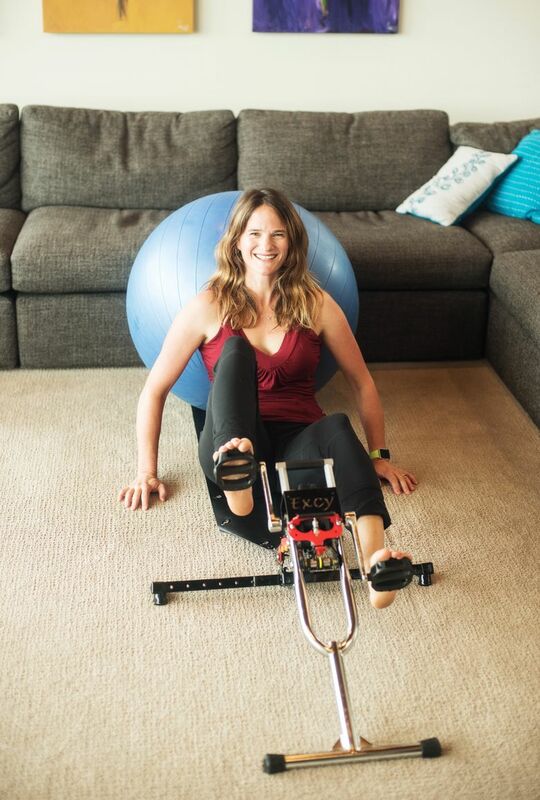 Mobile coach: Mehl, who has long worked with tech clients, created quick workouts that helped her lose weight and gain muscle, and filmed short instructional videos. This week Excy will launch its mobile app, which includes video workouts, time and calorie counts and digital goals with reminders. Light weight, strong resistance: The Excy, which starts at $557, offers 30 pounds of resistance while you work out, despite its lightweight frame. Mehl said the company achieved that by using a piece of material it called the Excy Keeper, which attaches to the machine. The user sits on the Keeper, which stops the Excy from scooting away, a common complaint about portable exercise machines. A few minutes a day: Mehl’s video workouts are between 6 and 23 minutes — designed for high intensity and busy schedules. She says she lost 25 pounds in the first three months of testing the machine. Coming up: Excy, which has two full-time employees, plans to focus on further developing its mobile app and integrating it into equipment such as heart-rate monitors and fitness wearables.